The Viikarien Viikki nature trail is suitable for children aged 5–10 who are hiking with adults. The nature trail introduces children to nature conservation and the area’s habitats while also providing opportunities to make observations, think about nature, engage in play activities, take snack breaks and learn. The trail begins at the yard of the former Gardenia and is approximately three kilometres long. We recommend reserving a few hours for the trail. 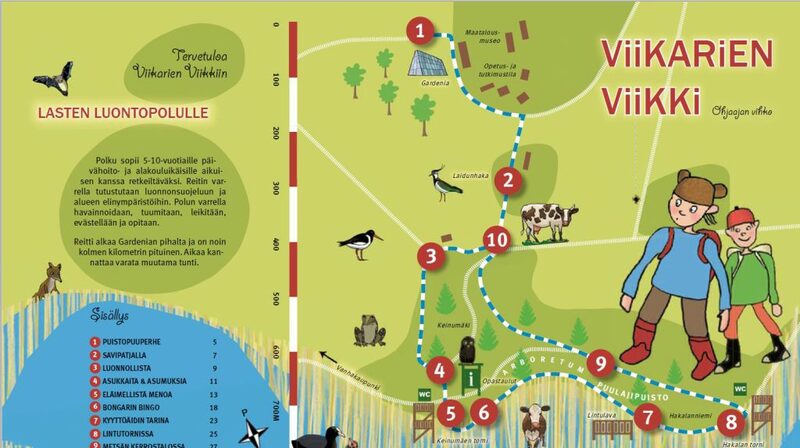 The trail’s guide booklet can be picked up from the City of Helsinki Environment Centre, at Viikinkaari 2 a. The Centre also loans out props for the trail’s drama segments. For reservations, please call +358 (0)9 310 31535. You can have a look at the Viikarien Viikki guide booklet here (in Finnish).